Figure 5.8. Electron micrographs of the individual 50S subunits of E. coli ribosomes and a model of them (V.D. Vasiliev, O.M. Selivanova & S.N. Ryazantsev, J. Mol. Biol. 171, 561-569, 1983). A: Metal-shadowed particles prepared as described in the legend to Fig. 5.2 A. Upper row: the so-called crown-like projection when the particle is viewed from its "back" convex side turned away from the 30S subunit in the ribosome. Lower row: the lateral projection when the particle is viewed from the side of its L1-ridge. B: Negatively stained subunits prepared as described in the legend to Fig. 5.1. Upper row: the crown-like projection. Lower row: the lateral projection. C: The model of the 50S subunit viewed at different angles when rotated around the vertical axis. (Original photos by V.D. Vasiliev). Figure 5.9. Averaged images of the negatively stained 50S subunit in the crown-like projection. (Original photos by V.D. Vasiliev). lobe" manner. The head-to-head association may be seen clearly on an electron microphotographs of the other projection of 70S ribosomes (Fig. 5.10 B). An electron microscopic image of the "overlap" projection demonstrates that the 30S subunit covers only a part of the flattened side of the 50S subunit (Fig. 5.10 A). The region at the base of the stalk remains exposed. This region appears to accommodate functionally important ribosomal sites (see Section 9). A photograph of the low resolution model of the 70S ribosome with the coupled 30S and 50S subunits in head-to-head and side lobe-to-side lobe association is presented at the bottom of Fig. 5.10. Figure 5.10. Electron micrographs of the individual 70S ribosomes from E. coli and the model in two different projections (V.D. Vasiliev, O.M. Selivanova, V.I. Baranov & A.S. Spirin, FEBS Lett. 155, 167-172, 1983). A: The so-called overlap projection when the 30S subunit faces the viewer and covers a part of the 50S subunit. B: The non-overlap or lateral projection viewed from the side of the L7/L12 stalk. The particles were stained with uranyl acetate as described in the legend to Fig. 5.1. (Original photos by V.D. Vasiliev). 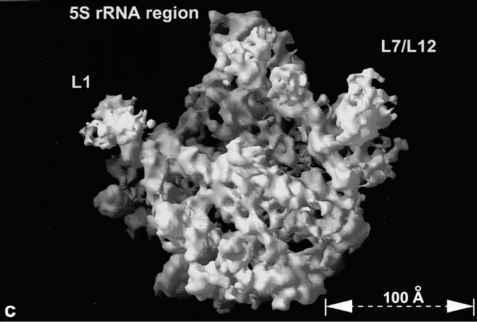 Recently, further significant progress in electron microscopy of ribosomes has been achieved. It is based on several developments of the ribosome imaging and image processing techniques. The method of cryo-electron microscopy has been developed which allows to visualize the ribosomes embedded in thin film of vitreous ice without any staining. 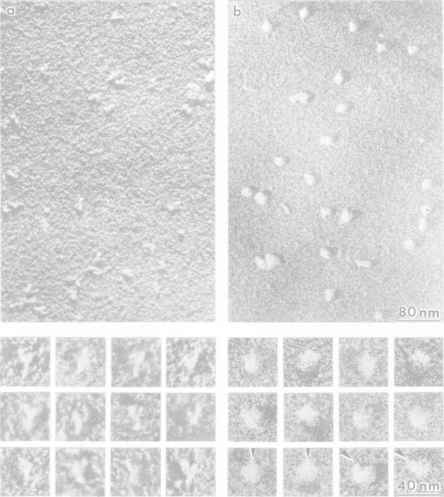 The images are recorded under low-dose conditions and optimal use of the phase contrast which contributes basically to the image formation of unstained biological samples. The vitrification preserves the particles in a fully hydrated state, and investigation of the native structure of the ribosomes becomes possible. Special computer programs making use of several thousands of images have been created for three-dimensional reconstruction of the ribosome. The 3D reconstruction is based on numerous projections that show the particles from different directions. In electron microscopy, in contrast to medical X-ray computerized tomography, the necessary projections cannot be obtained by consecutive image recording of the same particles under different angles to the electron beam. To prevent a radiation damage each particle under investigation must be illuminated only once. Therefore, a full data set necessary for 3D reconstruction is collected simultaneously from different particle projections of the same microphotograph. The projections arise by chance and the problem is to assign an orientation to each of them in a common coordinate system. Two different approaches were applied to solve this problem resulting in 3D reconstruction of the bacterial ribosome with the resolution of about 25 A (J. Frank et al., 1995, and M. van Heel and associates, 1995; see Figs. 5.11 and 5.12, respectively). The overall shape of the new high-resolution models of the 70S ribosome (Figs. 5.11 and 5.12) is very close to that of the foregoing low-resolution model derived by visual interpretation of the ribosome images (Fig. 5.10). Although the surface of the ribosome is much more irregular at high resolution, the main characteristic morphological features of both the subunits are well recognized. The small subunit consists of a head, a side lobe and a body, and the large subunit is roughly hemispherical with three protuberances. Figure 5.11. Stereo representation of the three-dimensional density map of the E. coli 70S ribosome in the non-overlap projection viewed from the L7/L12 stalk side (J. Frank, J. Zhu, P. Penczek, Y. Li, S. Srivastava, A. Verschoor, M. Radermacher, R. Grassucci, R.K. Lata & R.K. Agrawal, Nature 376, 441-444, 1995). The 3D reconstruction is based on so-called random-conical-tilt-series approach. This elegant approach exploits the random azimutal orientations of asymmetrical particles lined in one (or several) preferred orientation relative to the support film. It starts from a pair of micrographs showing the same field both from a high tilt angle and without tilt. The tilted-field image is recorded first and only particle images from this field enter the 3D reconstruction. The untilted-specimen images are used as references to convert the random planar particle orientations in the real definite projections. The first 3D reconstruction is then improved by iterative procedures. Finally, the orientation of each projection is determined individually by matching it to computed projections of the previous model. This 25A 3D reconstruction of the 70S ribosome is obtained by combining 4300 individual images. (Courtesy of J. Frank, New York State Department of Health, Albany). threshold values). In the model of van Heel and coworkers, approximately half the total volume of the ribosome is found to consist of solvent regions, including the inter-subunit space and intra-subunit channels and cavities that give the appearance of "Swiss cheese pieces" to the ribosomal particles. The density threshold chosen by Frank and coworkers was evidently lower, and one bifurcated channel in 50S subunit part of their model is observed instead of an extensive network of channels of van Heel's model. The most important new feature visible on the reconstructed unstained, ice-embedded ribosome (both 70S and 80S, see also Fig. 5.13) is a large cavity between the ribosomal subunits, in the region of their necks. This inter-subunit space is sufficient to accommodate tRNA molecules, so that it is strongly believed that the cavity serves as a tRNA-binding pocket of the ribosome. New specific details can also be seen on each subunit. Generally, the shape and morphological features of the coupled ice-embedded subunits are somewhat different from those of the isolated particles. Figure 5.12. Stereo representation of the three-dimensional reconstruction of the E. coli 70S ribosome in the non-overlap projection viewed from the side opposite to the L7/L12 stalk (H. Stark, F. Miller, E.V. Orlova, M. Schatz, P. Dube, T. Erdemir, F. Zemlin, R. Brimacombe & M. van Heel, Structure 3, 815-821, 1995). The 3D reconstruction is based on "angular reconstruction" approach which allows to determine the relative angular orientations of the particles arbitrarily arranged within a vitreous ice matrix. This 23A 3D reconstruction is derived from 2447 individual images. (Courtesy of M. van Heel and H. Stark, Fritz Haber Institute, the Max Planck Society, Berlin). Figure 5.13. Stereo representation of the three-dimensional reconstruction of the 80S ribosome in the non-overlap projection viewed from the rod-like stalk (A. Verschoor, S. Srivastava, R. Grassucci & J. Frank, J. Cell Biol. 133, 495-505, 1996). (Courtesy of J. Frank, New York State Department of Health, Albany). The most marked differences are the structural changes of the small subunit in the neck and side lobe ("platform") regions. An additional thin connection between the head and the body appears, so that a channel penetrating the neck is formed instead of an open gap. The side lobe of the 30S subunit now is further separated from the head when compared to the crude model of the isolated particle. It appears to be spade-shaped and forms a well-defined cavity with the head. Another structural elements are the "beak" in the head region and the "toe" or "spur" extending from the end of the body distal to the head. The large subunit seems to be less changed upon association into the full ribosome. The most apparent difference with the isolated subunit is that the rod-like (L7/L12) stalk is truncated and rather directed perpendicular to the subunit interface, instead of being stuck out from the subunit body in the plane of the contacting surface of the isolated subunit. It is noteworthy that the subunits in the full ribosome (at least in the "empty", non-translating ribosome) are seen as drawn apart, especially at the side of the rod-like stalk, thus leaving a free access from outside to the inter-subunit space. The numerous tight contacts between two subunits are clearly visible mainly in the region of the side lobes ("platform" of the small subunit and the L1 ridge of the large subunit). The contact between the heads of the two subunits looks less prominent and, possibly, nonpermanent. If the subunits are capable of swinging in and out (Section 9.6), the side lobe contact may serve as a main hinge of the pulsating ribosome. It is remarkable that the ribosomal particles including full ribosomes and their isolated subunits can be crystallized, and in some cases the crystals are well ordered and diffract X-rays up to about 3A resolution. Generally, the crystallographic studies of ribosomal particles have demonstrated the similarity of the X-ray electron density maps with the electron microscopy maps. Fig. 5.14 shows the result of the first X-ray crystallographic study of a ribosomal particle where the electron density map at 9A resolution was obtained for the 50S subunit of the archaean ribosome. It is seen that all morphological features revealed earlier by electron microscopy are confirmed. At the same time, several important details of the ribosome structure have been defined more precisely. Further work with X-ray crystallography of ribosomes is aimed at the solution of the problem of detailed quaternary structure of the particles. Figure 5.14. The 50S ribosomal subunit of archaebacterium Haloarcula marismurtui shown in the crown view from the side that interacts with the 30S subunit: a surface rendition of a 9A resolution X-ray electron density map. (Reproduced from N. Ban, B. Freeborn, P. Nissen, P. Penczek, R. A. Grassucci, R. Sweet, J. Frank, P. B. Moore & T. A. Steitz, Cell 93, 1105-1115, 1998, with permission).